While there's no shortage of child-friendly tablets, there's always been one sticking point: they're just a bit too expensive, given that they'll be dropped, slobbered on and generally abused. This Archos tablet, however, may well solve that problem. The Kurio: A Kid&apos;s Tablet That Parents Can Use, Too? 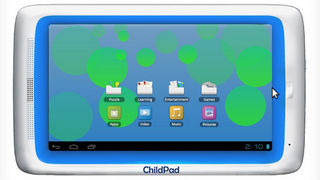 The Verge reports that Archos has just announced Child Pad, a $129 device aimed at kids. It comes with a 7-inch screen, 1GHz processor, 1GB of RAM and Android 4.0. No word on storage, but its version of Ice Cream Sandwich is subtly tweaked for kids, with lively skins, pre-installed games and stronger parental controls.